By: Erik Jelinek on 20/09/2012. 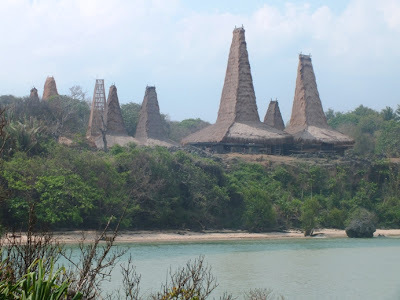 The spectacular rumah adat of Ratenggaro village in west Sumba. In this part of the island the houses are larger (housing up to four families) and the roofs taller. Houses in Sumba all share a similar layout: ground floor for animals, first floor for people, second floor for eating communal meals and for the ancestral spirits, or marapu. On paper most Sumbanese are either Christian or Catholic. Religion in Indonesia is a strange thing. The country’s founding fathers based its constitution on a philosophy they dubbed Pancasila (meaning Five Principles). The first of these principles is “The state shall be based on the belief in the one and only God“. This was written to ease tensions and find common ground between the various religious groups, namely Muslims and Christian denominations as it panders to each of them equally. The constitution initially only recognized five religions: Islam, Christianity, Catholicism (because Protestantism and Catholicism were introduced by the rival Dutch and Portuguese they are considered separate religions), Hinduism and Buddhism (the latter two practiced by the Balinese and Indonesian Chinese respectively); and every person must choose one which is recorded on their official documents and ID*. Of course the latter two are far from being monotheistic either, but semantic acrobatics allowed them to be defined as such. However indigenous, animistic religions and practices are not recognized and so “primitive” tribespeople have to choose another “authorized” religion. It usually tends to be some form of Christianity, as it is less proscriptive and allows them to continue their age-old customs unmolested. 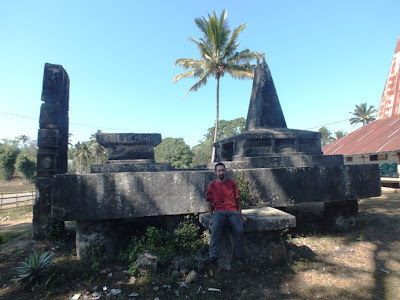 This is the largest megalithic tomb in Sumba (I’m in the photo so that you can get an idea of its size). It is found outside a rather ordinary-looking house was erected in the early years of the last century and, according to the descendants, took several hundred people two months to drag from the quarry only 3km away. The most visible manifestation of Sumbanese tribal culture comes in the form of their villages and rumah adat, or traditional houses. They resemble giant, rectangular, thatched witches’ hats, usually aligned in two rows, between them ancestral tombs, either made of single, megalithic slabs of limestone or, for those tribespeople who move with the times, of concrete and covered with wall tiles with pictures of The Last Supper and a hippie, Caucasian Jesus. Tombs are intricately linked to the houses of their former occupants, as it is the belief of the Sumbanese that ancestors watch over and protect their descendants. But graves are not just symbolic items to be revered from a distance, instead they are useful household tools and act as perches to sit on, shade to sit under, drying racks for clothes and cash crops, and general village furniture to amuse young children and dogs. The older tombs, from about a century ago, are the most magnificent: large, monolithic slabs of limestone with anthropomorphic carvings, sometimes (if you include accessory structures like roofs and stelae) as large as small houses. The houses themselves follow a standard pattern: a ground floor sty for livestock (usually pigs, buffalo and omnipresent chickens); the first floor, which is deceptively large, as a general living space, ringed by a large, low, covered porch for protection from the intense midday sun and lazing and chatting in the evenings; and a rarely-used second floor for ceremonial family meals and to house the ancestral clan spirits, or merapu, who still play a fundamental role in the cultural and ceremonial life in Sumba. 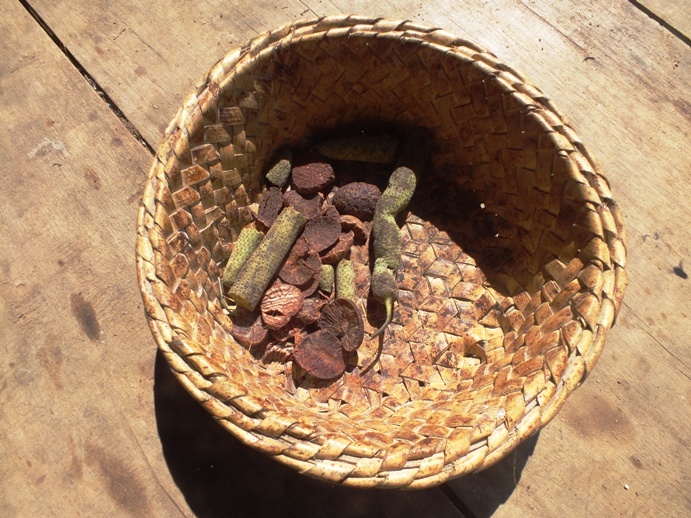 A basket of betel (areca) nuts and a strange, catkin-like vegetable that is chewed along with it. Betel nuts are an important currency among Sumbanese, either to be shared an chewed together, or offered to the marapu spirits. Of course today most rumah adat have made way for concrete walls, bricks and roofs of corrugated metal, albeit in a high, pointy style in deference to traditional tastes. One cannot deny the people the desire to improve their quality of life, and modern houses, although potentially less practical in a tropical climate, are certainly cheaper. Nevertheless some rumah adat remain and even in the most unlikely places. Right in the heart of Waikabubak, the capital of West Sumba (not quite a bustling metropolis, but a nondescript, modern, provincial town), there are a trio of traditional kampung. The fact that they are so readily accessible means that they are quite tolerant of tourists and prosperous, not minding people poking around as long as they are willing to peruse their ikat souvenirs that the women weave in the evenings. I was fortunate enough to be invited in to spend the night with a family and see how they live, and was pleased to see a harmonious blending of tradition and modernity: posters of Britney Spears and Avril Lavigne alongside a rack of buffalo horns and boar tusks, bamboo interior and furniture with refrigerator in the corner, evening weaving on a portable loom followed by English lessons for the youngsters of the village. 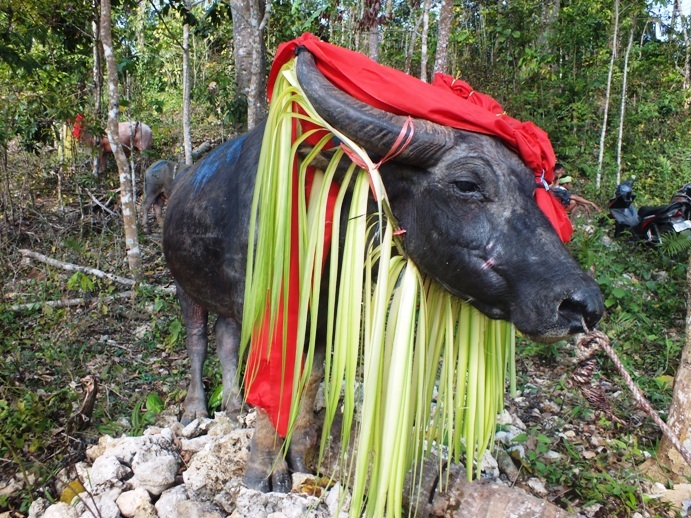 The Sumbanese are, like their Torajan brethren in Sulawesi, a rather morbid bunch, going in for huge funeral ceremonies with the obligatory buffalo sacrifices. My luck for stumbling along ceremonies held with me and I managed to chance across a funeral ceremony – although stumble upon perhaps isn’t the right word, I just curiously followed the cacophony generated a procession of people beating drums and banging gongs whilst leading buffaloes, their horns decorated with ribbons and dangling strips of sugar cane leaves, up to the village where the ceremony was being held. 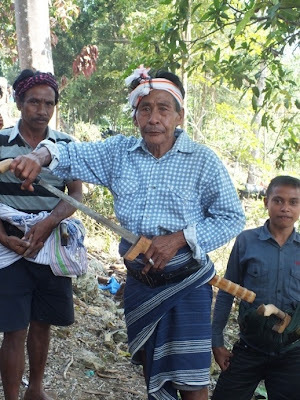 Women wearing colorful sarongs, whilst the men’s plainer, most with parangs tucked at their sides in long wooden scabbards and embroidered headbands on their brows. At this particular wake most of the two hundred or so guests were sitting in any available shade to escape the searing noonday heat, chatting, gossiping and catching up, local coffee, tea, cigarettes, sly pitchers of arak and betel nuts were passed around, the latter regurgitated a few minutes later as thick, red spittle that began to carpet the ground around the village. It took some time for men and beasts to assemble, but once they did finally coalesce the slaughter began. 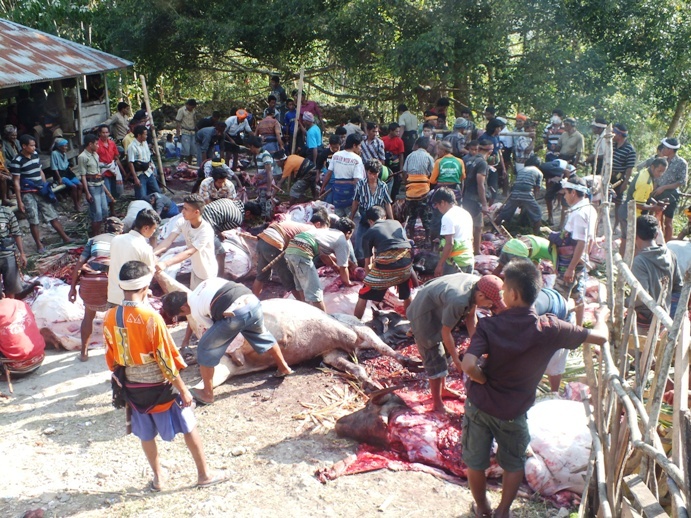 The method was very similar to Torajan sacrifices (although the neck-slashing was somewhat hampered by the buffaloes’ decorations) and produced an equally excessive amount of blood that quickly saturated the small open square where the sacrifices were taking place (although quite a lot of it could also have been betel nut spit, which has an identical color and consistency of blood). There was only room enough to kill a dozen beasts (got to keep some fun for later) and the men quickly set about the task of cutting them up and dividing the meat amongst the guests. The stench of coppery blood, partially digested faecal matter, urine and sweat might have been heaven for the flotilla of flies, but left me unimpressed. I returned to town with a truckful of locals who had picked me up on the way to the village. On the way in they had been transporting a couple of buffaloes, which had now undergone a fascinating transmogrification into a couple of racks of ribs, a giant liver, a right hindleg and at least two of its four stomachs. …not looking so smart now. The village’s small square has been turned into an abattoir where the heat, blood, sweat and partly digested vegetable matter mingle to form an acrid stench. It seems strange to me that Sumba has fallen off the mainstream tourist radar, given its vibrant, larger-than-life tribal culture. But then again I am glad: the people are perhaps less welcoming, more distrustful, the hotels more expensive (the cheapest hotel room in Waikububak had five beds – not great value for money for the solitary traveller), and understanding of the idea of tourism sketchy at best. Yet to be able to share a tea with an old Sumbanese man on his porch and ask him about the giant tomb parked outside his house, to be able to spend a night in a real rumah adat, invited in on the spur of the moment, and to be able to witness a funeral ceremony as the only outsider present (unlike in Toraja where I was but one of a group of hundred or so tourists taking photos of the buffalo slaughter) were very special and more than worth the extra effort (perhaps even sweeter because of the extra effort). Sumbanese man wearing a sarong and parang (long, single-edged knife) and about to show me how sharp it was. Luckily he was friendly, although Sumba is perhaps the only place in Indonesia where I have encountered distrustful tribal frowns as well as the omnipresent smiles. *This leads to some bizarre legal quirks. People are only allowed to marry within their own religion, and so if people of different religions want to marry (which happens relatively frequently) then one of them must convert to the other’s religion. Similarly atheism is illegal, and for most people completely incomprehensible anyway, as are various non-Sunni branches of Islam (such as Shi’ism and Sufism, despite Islam having been introduced to Indonesia by Sufi saints). After the fall of Suharto in 1998 Confucianism was also reinstated as an official religion. Nevertheless, in this highly diverse country it is surprising how tolerant people of different religions are of each other.